In the period preceding the state elections, both parties had been generous in their offerings to local Greek organisations; but do these funds actually cater for the community's needs? 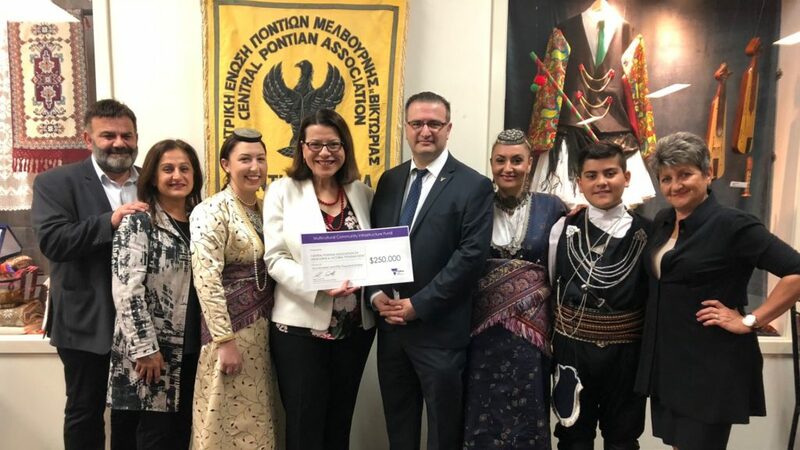 Victorian Minister Jenny Mikakos offering Central Pontian Association Pontiaki Estia a grant of $250,000 to repair the crumbling facade of its edifice in Brunswick. «Τι τα θέλεις τα λεφτά, να τα κάψεις, τι τα θες;» Eleni Vitali. «Για τα λεφτά τα κάνεις όλα» Antypas. Recently, a friend, who is on the committee of management of a local Greek organisation telephoned me in a panic. “We did a stupid thing, selling out clubhouse,” he panted in manifest distress. In the period preceding the state elections, both parties had been generous in their offerings to local Greek organisations, many of which were promised considerable sums in order to effect capital repairs on their premises. The political term for this type of activity is called ‘pork-barrelling’ and it raised the ire of many. Community activists such as George Zangalis had, for example, publicly questioned the wisdom of offering Central Pontian Association Pontiaki Estia a grant of $250,000 in order to repair the crumbling façade of its edifice in Brunswick. Many pointed to clubs that they argued play an insignificant role both within the broader Greek and local communities, restrict their scope to the odd dinner dance and barbecue, and question why it is beneficial to expend taxpayer money on adding value to a capital asset that sooner or later (probably sooner) will be sold when the club, of constantly dwindling membership is inevitably wound up for lack of members. Some considered as profligate, the opposition’s now defunct promise to fund the Greek presidential guard’s attendance at four consecutive Greek National Day celebrations at the Shrine of Remembrance, while the re-elected government’s promise of substantial funds to complete the striking Parthenon frieze replica around the iconic Greek Orthodox Community of Melbourne and Victoria headquarters in the heart of the city raised the eyebrows of others who questioned whether other matters are more urgent and should take priority. Although property ownership seems to take on almost holy significance for most members of the first generation, it is not the centre of our pluralistic identity. We should question not the grant of funds for the reconstruction of Pontiaki Estia’s building. It has earned them. Pontiaki Estia is a vital hub of Hellenism in an area that has historically been synonymous with the formation of the Greek identity in Melbourne. Its premises is a vibrant hive of activity, populated constantly by members of diverse generations. Within its walls, a distinct 3,000 year old cultural and linguistic tradition is not only being preserved, but is also being interpreted and disseminated to a wider audience. Most importantly, it is open, embracing of others, integrated within the broader mainstream community in a way that other clubs are not, socially active and is predominantly run by the second and third generations. Furthermore, it obtained its funding only after its building experienced significant unforeseen damage and its president painstakingly compiled a voluminous 60 page submission detailing exactly where funds would be expended. Clubs of this nature, progressive, vibrant and relevant, deserve such one-off assistance. Similarly, we should begrudge not the promise of a gift of funds to the GOCMV for the completion of the frieze that will add character and reinforce the Greek heritage of Lonsdale Street. The GOCMV has, through many decades, played a vital role in the cultural life of the City of Melbourne and having this acknowledged by the government assisting in the completion of a building that will prove of historical significance and act as a perennial landmark of our presence within the metropolis is a just reward for a job well done. We should have no problem with smaller clubs, of limited scope and relevance to the mainstream receiving funds to effect improvements on their clubhouses either, even if such clubs are in terminal decline. Just the fact that they provide a place for their ever dwindling members to get together, however infrequently, and enjoy each other’s company in convivial surroundings, constitutes ample evidence of their social utility, regardless as to whether this is sustainable over a lengthy period of time. The members of these clubs, largely of pension age, have through their hard work, made vital contributions to our state. Grants of money to fix a leaky roof, or install a new kitchen, or repair a toilet to be used during their leisure outings, is a worthy gesture of gratitude. What should be of concern to us however, is the fact that the conglomeration of repair grants at election times seems to indicate that the State seems able to relate to us as a community only in relation to the real estate that we own, reflecting in part, the way we see ourselves. The State, albeit well-meaning, seems unable to engage with us on any other level than that of property owners and it is thus easy for the State to point to statistics claiming that it has provided assistance to our community, by providing cash handouts that though welcome, do nothing to address concerns of the Greeks of Melbourne specific to their own cultural and social issues, or indeed, their priorities. Instead, the prevalence of these handouts, rewards for good behaviour, seem to entrench the marginalisation of the organised Greek community and their status as supplicants rather than equal partners and stakeholders within mainstream society. Furthermore, in a constantly evolving, increasingly urbanised and multi-faceted society, the Greeks of Victoria are fast exhausting the concept of a distinct entity. They are diffuse, distinct and diverse. They defy definitions and subvert stereotypes. Certainly, they are no longer represented by aged and decaying clubs based on Greek regional affiliations that bear slight relevance to the ever changing needs of the emerging generations, however historically important those clubs may be. In becoming complicit, through acceptance, in the diversion of funds away from emerging priorities, in order to prop up a government regulated and defined form of archaic ethnic manifestation that no longer represents us, our identity, or our needs, are we in fact engaging in acts deleterious to our future? Possibly. But the fact of the matter is that, unless we are able to articulate such needs as are unaccounted for, unless we are able to find new and novel ways to organise as identifiable entities or interest groups that represent our current interest, as opposed to those defined by the State or previous generations, in order to seek requisite funding for those needs, and finally, unless as a community we are able to come together in order to have a substantive discussion that will enable us to identify and prioritise our needs, we will remain a little people, a disparate community of small, isolated and inward looking entities, suspicious of each other, fighting over the scraps proffered over the election table, jealously guarding our privileges and begrudging others their own. Although property ownership seems to take on almost holy significance as a key to identity formation and manifestation for most members of the first generation, it is not, nor should it be at the centre of our pluralistic identity. It remains to be seen whether we are able to re-organise ourselves in such a manner where people, their social and cultural needs will assume priority over the acquisition and maintenance of real estate. It is people that give institutions life and in their absence, the edifices we are so proud of and squabble over are nothing but hollow sepulchres and the funds thrown at them by political parties eager and knowing how to please, nothing more, than chaff in the wind, unless accompanied by serious re-structuring and mature forward planning.